Bamber Bridge continued their unbeaten start to the 2018/19 season, with a goalless draw against Warrington Town at the Sir Tom Finney Stadium. Neil Reynolds insisted it would be a tough game for his side prior to kick off, but come the final whistle he was left frustrated after seeing a number of golden chances go begging. Brig tied Brad Carsley down to a new contract last week and the No.9 came desperately close to opening the score inside five minutes, when his bullet header at the back post was somehow kept out by Anthony McMillan. Adam Dodd then had the chance to open the scoring from the penalty spot, after Kieran Charnock was caught inside the Warrington box. Up stepped Dodd, whose left-footed chipped effort beat McMillan, but not the crossbar and Warrington cleared their lines following the rebound. But Warrington survived and both sides headed in at the break with the score 0-0. Whatever Paul Carden said to his players at half time worked, the Yellows came out of the traps well in the second half and went on to have the better of the second forty five. That said, Carsley had another great opportunity on 50 minutes when Ryan White did brilliantly to lay it on a plate for him, but the Brig striker could only guide his effort wide of the far post. Richard Brodie had a quiet first half but on the hour mark he really should’ve headed the visitors in front, the No.9 guiding the ball the wrong side of the post after a fortunate flick on. Chances then fell to Tony Gray and captain Mark Roberts, but Brig kept their clean sheet in tact despite falling under severe pressure. And their solid defensive work almost earned them the ultimate reward, when Carsley had his shot cleared off the line after McMillan saved Alistair Waddecar’s well-struck drive. It was a real chance to nick all three points – Waddecar’s shot was parried out only as far as three Brig bodies, who stood in hesitation, before Carsley decided to take a stab at the loose ball. 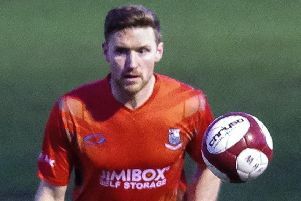 Lloyd Rigby had not been called upon properly until the 90th minute, when he was off his line in a flash to smother Benjamin Garrity’s strike from a matter of yards out. In a game that Brig really ought to have won, they could easily have ended up with nothing if it was not for Rigby’s save. Nonetheless the unbeaten run continues for Neil Reynolds’ side, who kept their first clean sheet of the season and now look ahead to the visit of Witton Albion on Saturday.